This is the second in a series of articles on my experiences working with the MOST team on a study of Betelgeuse. This time, I look at the process of selecting targets and pointing the telescope. When I first heard about public proposals for MOST (Microvariability and Oscillations of STars), I was quite interested and spent some time reading up on MOST on both the main web site and the outreach web site called MOST = My Own Space Telescope. I needed to understand both the capabilities of MOST and its limitations. I should note that the proposal site is still open and accepting proposals. Just perhaps, you too may get a chance to pilot a space telescope. The timescale of the variability must be short enough to be sampled well during the several weeks to two months that MOST can monitor a star continuously, or from year to year by having MOST return to the same target field in the sky. Turbulence and variability in massive stars like giants and Wolf-Rayet Stars (just one type of pre-supernova star). How to pick a target? The MOST Science Team chooses targets based on the science they want to explore. What types of variations can teach them about the nature and life story of a star or planets around it? Are those variations likely in a particular star? And is MOST sensitive enough to see those particular variations in that particular star? I think of this as the “bottom up” approach. I decided that as an amateur not immersed in the details and subtleties of astrophysics my best bet would be to play a different game and try a top down approach. This approach led me to make a list of visually interesting and recognizable stars most of which were observable with the naked eye. My reason for choosing recognizable stars was to better connect with the public. Next I investigated the list for stars that would be (a) accessible to MOST and (b) suitable science targets for its mission. Again the order may seem upside down but determining visibility was easier to do in bulk than doing the research first. Coincidentally, I later found that one of the stars on my list (but not proposed) had already been selected by the Science Team in their normal evaluation process. How do I aim this thing? The MOST = My Own Space Telescope public proposals page contains a lot of background on choosing target stars for MOST and the process for the public to submit proposals. Once you've selected an interesting target, you need to ensure that MOST can see it. Targets (with some exceptions) need to be meet two major positional constraints (1) the CVZ or Continuous Viewing Zone, and (2) the SSR or Sun Sensor Range. The CVZ dictates how long MOST can look at a star without interruption and the SSR constraint has to do with MOST keeping its back and its main solar panels to the Sun (as shown below on the left), as well as maintaining a reasonable temperature for the spacecraft. The proposal site has a Java based Target Validation Tool that checks all of this but I built one in a spread sheet to work with my long list. Right image plotted from my proposal spreadsheet. The second chart (above and to the right) shows a plot of some of the target stars that have been selected and proposed as candidates. The red arrows point to Betelgeuse and LG 5039 (a microquasar) - the first two winning proposals submitted by myself and by Gordon Sarty. 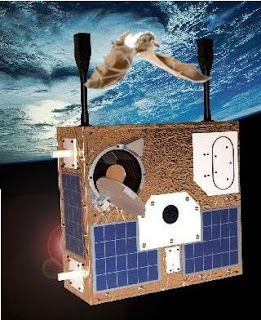 The proposals were examined by the MOST Science Team to ensure that the candidates were likely to yield good science data; and by the Operations Team to ensure that the target could be safely observed by the satellite. Successful proposals are announced and scheduled. I should say a few words about the proposals themselves. The information needed by the team is not large. They need to know the target star, its name (or identifier) and coordinates, your contact information, and a brief description of why you think this would be a good subject of study. If you feel the need to write a bit more, there is a place to attach a small document. You can find the submission form here. MOST follows a Science Target by tracking Guide Stars near the target in the telescopes field of view. All of the Target and Guide Stars must to be within a maximum of 0.86 degrees (a bit less than the twice the diameter of the full Moon). There must be enough Guide Stars of suitable brightness close to a target for that star to be observed. That is not normally a problem. As you can see, Betelgeuse (shown by the cross-hairs) is positioned under one of the central Fabry microlenses. The boxes show Guide Stars used to keep MOST pointing at Betelgeuse. While in theory only two guide stars are required to keep the satellite pointed, in practice up to about 5 or 6 are actually used. 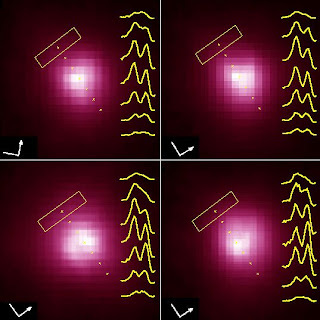 All of these images are defocused over several pixels so that even minute variations in the intensity of the pixels watching a guide star can be used to detect and correct for any drift. Another targeting wrinkle is that stars move ever so slightly due to what is know as "proper motion". Closer stars move more than ones further away. For example, Procyon (which has been studied by MOST) is very close to us compared to Betelgeuse and has a very much higher proper motion. The solution, a maneuver known as cross-hairs, takes sample measurements around the coordinates with the results being reviewed to fine tune the aim. Position rate sensors which across 3 axis. The Sun Sensor which uses a small pinhole camera on the back of MOST to determine the position of our Sun. The two external Magnetometers (the large rods near the telescope opening) which sense variations in the Earth's magnetic field. The Star Tracker that uses Guide Stars imaged by the satellite. The accuracy of these sensors varies but most of these provide no more than 1-2 degrees of accuracy. It is the sub-pixel measurements provided by the Star Tracker in combination with the internal reaction wheels that can deliver the small kicks to keep MOST on target to within 1 arc second or less! The other trick behind the ability of MOST to stare down a star for almost two months continuously is the orbit of the satellite. MOST orbits the Earth once about every 100 minutes but in a highly inclined orbit that keeps it moving east to west near the terminator so it can keep its back to the Sun and its front looking into the dark of deep space. Here is a track from Heavens Above of the orbit from near my location. Not all targets require continuous observation and MOST has the ability to switch from one target to another in mid orbit. The process itself takes only a couple of minutes and it also means that some stars that are within the Sun Sensor limits but outside of the CVZ can be observed. In fact one of my proposals was for pairs of targets which could be switched. Here there be Dragons Protons! One of the hazards MOST faces is radiation. A stray zap from a high-energy particle can scramble its software or damage its components. And MOST travels through a particularly hazardous realm known as the South Atlantic Anomaly (a low arm of the inner Van Allen radiation belt). NASA ROSAT image showing the SAA. The SAA is a potential satellite killer and MOST normally sails through it without harm. About once every two months, a cosmic ray hit during SAA passage can cause an on-board crash, from which MOST recovers usually by its next orbit. However, in January 2006, a very energetic particle hit disabled the original Star-tracker CCD, leaving only the Science CCD operational. The MOST Team always had a contingency plan to run the mission with only one CCD and it turns out that the performance of MOST is better than ever, after the MOST Team adapted to operating with a single CCD. MOST has changed since its launch. The teams have adapted and improved its capabilities in some surprising ways. The loss of the guiding CCD forced the team to use the Science CCD for both pointing and science, and to come up with ways that actually enhanced the performance of the mission. A fringe benefit is that the reduced power consumption of one CCD extends the potential lifetime of the MOST mission. The Science Team wanted to extract scientific data from the Guide Stars and the Operations Team made that possible. In fact, MOST has observed approximately 1500 stars in the 5+ years it’s been in orbit. The limiting factor is the amount of memory to buffer results between down-links to Earth and the high sampling rates usually demanded by MOST science. The MOST spacecraft buffers the science results and operational data until it can down link through one of three ground stations. Different send and receive frequencies are used. One interesting fact is that because the satellite is moving these radio frequencies must be Doppler shifted. Think of the horn of an approaching train and now try and imagine carrying on a conversation between two people on the ground and on the train. A network of computers and computer programs are designed to divide and coordinate the work while providing fail over capabilities. The work is divided logically into managing communications at each ground station, managing the pass or snapshot data from the satellite, updating command and control, and managing the parsing, pre-formatting and distributing the down-linked data. Planets and Stars - video - Just how big are they? I'd like to thank Dr. Jaymie Matthews, the Science Team, Ron Wessels, the Operations Team at MSCI (Microsat Systems Canada Inc. formerly the Space Systems division of Dynacon Inc.) for their cooperation and feedback. I'd also like to thank the MOST team, the University of British Columbia, and the Canadian Space Agency for permission to use their images. Another edition of the Carnival can be found here. 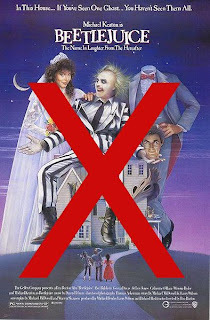 This is the first in a series of articles about my experience with the MOST (Microvariability and Oscillations of STars) team studying Betelgeuse in which Batman Mang does not summon Michael Keaton ... but rather we take a closer look at one of the brightest and most recognized stars in the night sky which is pronounced very nearly as beetle juice. 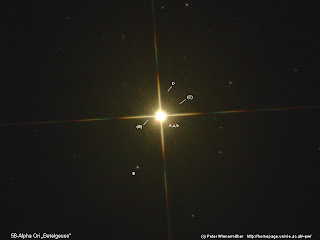 Below are some interesting images of Betelgeuse, an introduction to MOST's unusual imaging method, and an update on some facts about this remarkable star. Betelgeuse (α Orionis) is the 9th brightest star in our night sky visible in both the northern and southern hemispheres. Despite its alpha (α) designation, Betelgeuse is the 2nd brightest star in Orion after Rigel (it's variable and almost ties Rigel at its brightest). It's a red super giant much younger, heavier, and larger than our own Sun. It pumps out an enormous amount of energy and is expected to end its life in a spectacular supernova. Living fast and dying young. 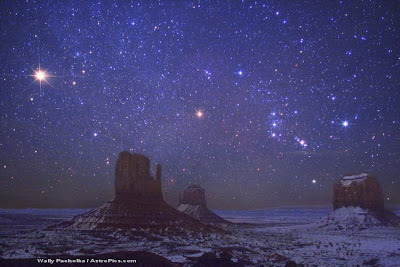 Our first image of Betelgeuse is a stunning photo of Orion and Mars and Monument Valley taken by Wally Pacholka (a former Scout and Scouter). Betelgeuse is the red star dead center. The familiar belt is vertical and the glow of the Orion nebula is clearly visible in the sword. Mars dominates the upper left. Reprinted with permission see AstroPics.com for more of his work. Next is the Hubble Space Telescope image from APOD taken in 1995 and the first image of the face of a star other than our Sun. The image is a false colour image combining several images taken with two different filters. The extreme difficulty of imaging the face of a star as more than a point can be seen in the pixel structure visible in the image. A large hot spot is visible on the disk. Our next image is Devil's Tower National Monument Betelgeuse as imaged by MOST on December 15, 2008 at the beginning of a one month study. Betelgeuse images, Credit: MOST Team, CSA and UBC. Whoa! What's this? It's not actually a direct image but a false colour 3D representation. MOST sees only intensity. The terrain and color effects are just ways to emphasise the strength of the signal. The flat image to the right of the 3D version is closer to what MOST actually sees. These images are "stacks" of 30 individual exposures combined to form a single image. But what's actually behind the image? Stars aren't donuts so why do these images look like one? Anyone who has ever focused any kind of reflecting telescope may be able to guess. The shape is a result of the telescope's construction (shown below). The telescope, a Rumak-Maksutov design, uses a compound optical path to get both a longer focal length and higher magnification. 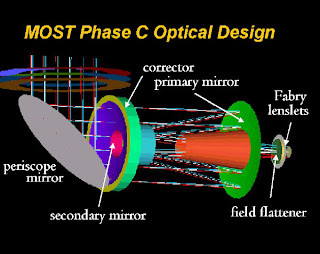 The primary mirror is donut shaped so the light can be reflected back through the hole to the imaging systems. This by itself won't cause the donut image. In perfect focus, a star will still image as point. But MOST isn't perfectly focused and that's why we see the donut. Credit: MOST Team, CSA and UBC. Wait, didn't the US Hubble Space Telescope have a focusing problem requiring a Shuttle mission to service the scope and install "glasses" to correct the problem? Surely we Canadians weren't doing a "me too"?! Why would anyone want to their images to be out of focus? The intensity of light reaching individual pixels is reduced and they are less likely to be blinded by bright stars which would otherwise require much higher "shutter" speeds than the CCD is capable of. By using measurements from all of the pixels exposed for each guide star, MOST can effectively calculate the position of those stars to within a fraction of a pixel! Without this MOST could not maintain its rock steady aim. Weirder still is the array of small Fabry microlenses that spread the light even further. To get the best data, MOST must keep the target star dead center in one of its Fabry lenses. The microlens produces an image of the mirror of the telescope, spread out over an area of about 1500 pixels (π * (25)^2 minus the area of the hole in the mirror). The mirror is illuminated by the light of Betelgeuse so that starlight is spread evenly over the same area on the CCD. In another part of the focal plane, not under a Fabry microlens, each pixel would represent 3 arcseconds across the sky. But under the Fabry array, the sky is no longer being imaged. The telescope entrance pupil (the corrector in a Maksutov design) is projected in focus, and it is through that pupil that the star light is passing. So in a sense, MOST is taking pictures of itself, lit up by Betelgeuse. Not only does the defocusing prevent MOST from being blinded by the brightest stars, it gives MOST enormous sensitivity to detect very subtle variations in the stars it's tasked with watching. I attended a talk by Dr. Jaymie Matthews the Principal Scientist for MOST at the Mississauga RASC's December meeting. He has some wonderful analogies one of which puts the 1 ppm (part per million) sensitivity of this instrument into perspective. Imagine an image of the Empire State Building at night. MOST can detect a change in intensity of the light equivalent to raising or lowering one blind by 3 cm! David (Mang) and Jaymie at the RASC presentation. There is always a lot going on with Betelgeuse and we should expect it to continue to be full of surprises. 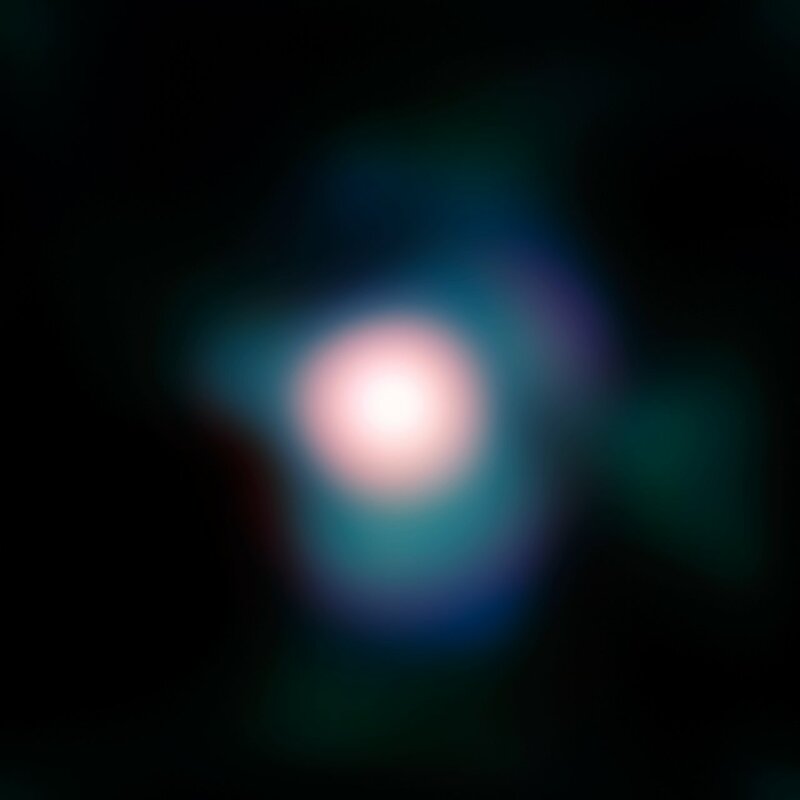 Betelgeuse was the first star, other than our Sun, to have its disk imaged! The first non-optical "images" of its disk were obtained in 1975 using the 4.0m Mayall telescope at Kitt Peak. This was later followed with the first true optical image taken by the Hubble Space telescope. These showed that Betelgeuse was far from uniform with a mottled surface, massive spots varying in temperature and brightness. Update: The next image was produced using the ESO's 8m Very Large Telescope with so-called lucky imaging. This is the best ever image of Betelgeuse and its asymetric plume of gas that extends up to six times the diameter of the star. For more information read Closest-Ever Look At Betelgeuse Reveals its Fiery Secret | Universe Today. A 2008 study using the Very Large Array of Radio Telescopes determined that Betelgeuse is further from us than previously thought. This also means that Betelgeuse is proportionally larger than previously thought! Prior to this Burnham's Celestial Handbook, a standard reference text, gave the distance to Betelgeuse as about 520 light years with a diameter ranging from 550 to 920 solar diameters and a mass of about 20 solar masses. Older sources gave it as 427 light years. The new distance is calculated as 640 light years (although allowance for error gives a range of 595 to 790 light years). Any variation due to error means that Betelgeuse is larger (or smaller) by the same proportion. The method used to find the distance to Betelgeuse is called the parallax method and involves measuring the apparent movement of a star from Earth at six month intervals using Earths orbit around the Sun to establish the longest possible base line for triangulation. Astronomers measure such distances in units called Parsecs which are then converted to light years (at 3.26 Light Years / Parsec). This only works for stars that are relatively close to us and depends upon our distance to the Sun. Astronomers often measure the size of stars in angular diameters as this avoids confusion when a distance is revised. Ignoring the fact that Betelgeuse varies in size and using a typical size (angular diameter) of 0.045" we can see that with this new distance the star is very much larger at 925 versus 750 times the size of our Sun. To put this in perspective, if Betelgeuse replaced our sun, it would swallow everything out to past Jupiter. Because there is a range and because Betelgeuse is variable and swells, Saturn too might be doomed. Betelgeuse is a variable star that dims and brightens over a period of 5.7 years ranging from magnitude 0.2 to 1.2. There is also a lesser cycle of between 150 and 300 days. Observations of Betelgeuse have shown that this dimming and brightening goes hand in hand with physical shrinking and swelling of the star. 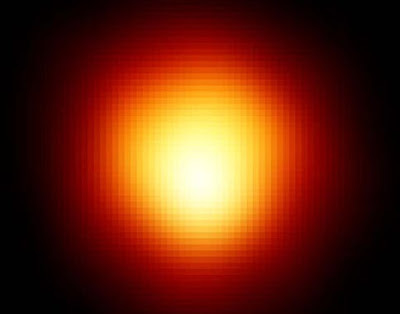 Betelgeuse can expand by almost 60% in size! Stranger still, Betelgeuse appears to be different sizes when looked at with different frequencies of the electromagnetic spectrum! In fact, under some wave lengths it's almost twice as large in diameter as in visible light. 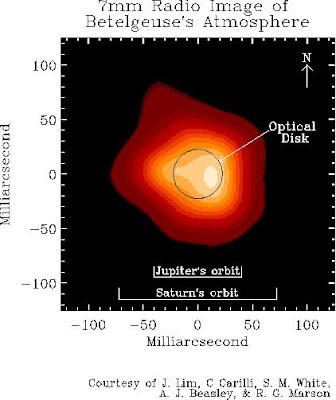 The image below from 1998 is just beyond the far infra-red and shows the size of the disk in visible light as well as comparing the size to the orbits of Jupiter and Saturn. Note: the lines showing the orbits of Jupiter and Saturn are based on the older smaller distance - they are too big! Saturn's orbit should run from +/-50 milliarcseconds. Betelgeuse's enormous volume vastly overwhelms its high mass and results in a photosphere that is so thin that it has been described as a red hot vacuum. The outer layers of the star may be even more interesting consisting of an extended chromosphere and dust clouds that grow and shrink with the star. To my knowledge, the question of Betelgeuse as a multiple star system has not been answered. Articles describing this can be found through the AAVSO (American Association of Variable Star Observers) and even though this isn't in the Wikipedia article there are notes in the accompanying discussion page. The image below clearly shows four companions labeled B through E (Betelgeuse itself is A). Most of these stars have been known since the time of Herschel. Credit: Peter Wienerroither, reprinted with permission. To give some idea of scale, the distance from Betelgeuse to the E star at 175 arcseconds should be about 0.5 light years based on the latest distance estimates. It's easy to see that these could be overlooked. Unlike well known binary systems, such as Albireo, these companions are quite dim ranging from 11 to almost 15th magnitude. For comparison, if a duplicate of our Sun orbited Betelgeuse it would appear about as bright as the brightest of these stars. And although several star catalogs list Betelgeuse as a multiple star system, Burnham states that it isn't certain if these are just field stars (or if they form a true multiple star system). The image above also shows labels for an "a" and "b" star; although they are not visible being hidden in the glare of the main star. These two companions were reported in 1985 based on observations using speckle interferometry. According to the study the "a" star orbits Betelgeuse at about 60 milliarcseconds and "b" orbits at about 500 milliarcseconds. This places the "a" star inside the Betelgeuse's complex outer layers. To my knowledge these observations were never reproduced and many astronomers are doubtful that this "a" star exists. Beteleguese is believed to have massive sunspots that have been apparent in images of the disk. Even the first image taken by the Hubble in 1996 showed evidence of a bright region. Recent images obtained from Infrared Optical Telescope Array (IOTA) interferometer on Mount Hopkins in Arizona and the Paris Observatory (LESIA) show two massive spots. The spots are larger than the distance from the Earth to our Sun! The Curious Case of the Shrinking Star | Universe Today - it seems that Betelgeuse has shrunk 15% since 1993. Betelgeuse is shrinking: Supernova or Supernothing | Space Disco - about people jumping to conclusions. Closest-Ever Look At Betelgeuse Reveals its Fiery Secret | Universe Today - ESO analysis showing giant gas plumes and gas movement across the surface of the star. Unprecedented Images Show Betelgeuse Has Sunspots | Universe Today - near infrared inferometry images show massive sunspots. Check it out here, it's cheap and it's good! With the McLaughlin Planetarium closed for more than a decade and the David Dunlap Observatory only closed a few months, it would seem that Southern Ontario is suffering in the area of Astronomy and Space Exploration outreach and education. That may soon be about to change. Please checkout the Earthshine foundation and their mission to to help build and operate a proposed state-of-the-art Planetarium and Space Discovery Centre in Southern Ontario. Click on the Earthshine logo to check them out.